It was a quintessential, 19th century funeral procession. Tuxedoed men with top hats grasped the reins of two solemn-looking, white horses tethered together. They pulled a black, glass-covered carriage with large, wooden wheels. On it were two sets of remains heading to the peaceful, sylvan cemetery in town. About three dozen family members walked behind the carriage. In fact, the exact same carriage followed the exact same route on a funeral procession that took place 142 years earlier for the decedents’ husband and father. Stop! Insert the sound of a record scratch here. What?! 142 years? This story, as unusual as it seems, is totally true and definitely befitting of a writer from the Romantic Period of American literature. The love story, its characters, and the fantastic ending all begin, and end, in Concord, Massachusetts. Having talent didn’t always mean financial freedom for them, but they did enjoy success in their lifetimes. Before marrying, the former Sophia Peabody had the rare honor of being a woman with an exhibit at the Boston Athenaeum. Nathaniel Hawthorne, as we all know, wrote such classics as The Scarlett Letter, The House of the Seven Gables, Young Goodman Brown, The Blithedale Romance, etc. The Hawthornes moved several times during their marriage. For a couple of years, they even lived in Liverpool, England when Nathaniel was appointed United States consul. 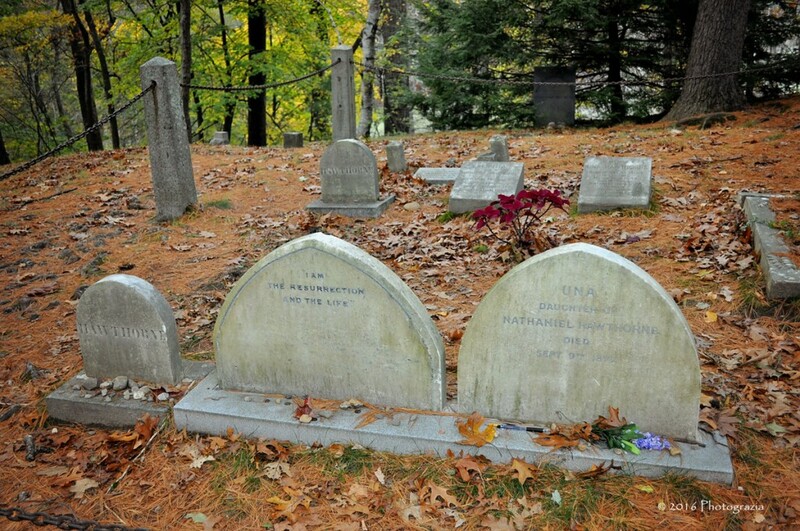 Despite all the moving and travel, the last home they lived in was, again, in Concord. It was the first home Nathaniel Hawthorne ever actually owned. It’s called The Wayside and visitors can tour the home when visiting Concord. The couple had three children in total – Una, Julian, and Rose. By today’s standards, their lives together would be considered the stuff of romantic, Hollywood movies. Their correspondence is well-known and much can be found about their fascinating lives online. They were married for twenty-two years. 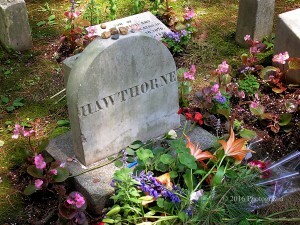 Some believe Hawthorne had more on his mind than just recuperation when he went to the White Mountains. In an interview that played on NPR on June 27, 2006, Wayside Park Ranger, Robert Derry talks about a theory in which he strongly believes: “I feel very sure he knew when he left the house that he wasn’t coming back,” Derry says, “and I think Sophia knew as well. It was the final goodbye.” They buried Hawthorne on a hill in one of the most beautiful cemeteries in New England, Sleepy Hollow Cemetery. There, on Author’s Ridge, the cortege brought his coffin to his final resting place. Sophia, meanwhile, left Concord with her children and moved to Germany, then England. In February 1871, Sophia contracted typhoid pneumonia and died. She was buried in Kensal Green Cemetery in London. Six years later, her daughter, Una, died at 33 and was buried in Kensal Green Cemetery, too. For all intents and purposes, that was the end of the story. 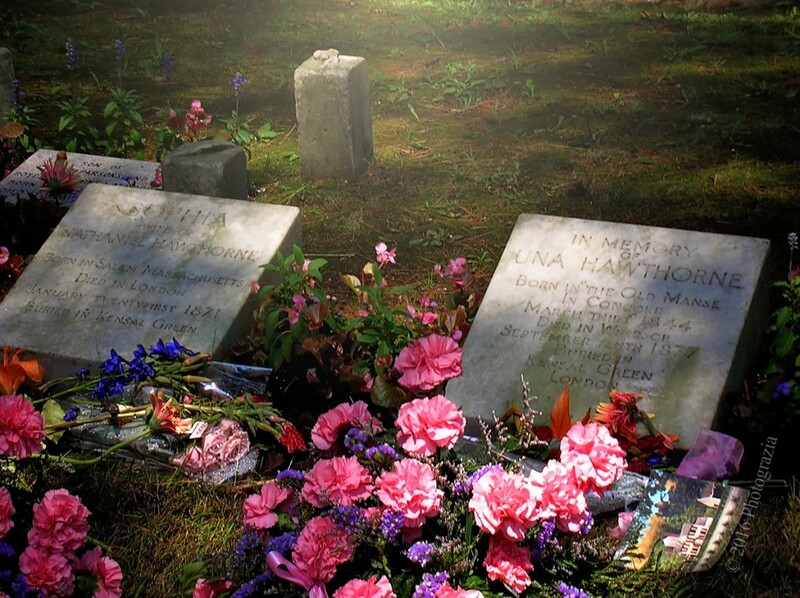 But, on June 26, 2006, mother and daughter were brought home to Concord through the efforts of their descendants. On that day, there was a public ceremony hosted by The Dominican Sisters of Hawthorne held at the Old Manse. There were great-granddaughters and great- great-granddaughters along with other descendants. Then, 142 years after it carried Nathaniel’s coffin, the same black carriage with the large, wooden wheels brought Sophia and Una through the quiet streets of their old hometown to Sleepy Hollow Cemetery in Concord. It is here that they will finally rest as a family again. I love Concord so much! At least once per year, for decades, I have made it a point to visit. On one of my annual visits, I just so happened to climb the path to Author’s Ridge and discovered a surprise. The graves of the Thoreaus, Alcotts, Hawthornes and Emersons usually have coins or pebbles atop the grave stones, or pencils placed in front, as signs of respect. 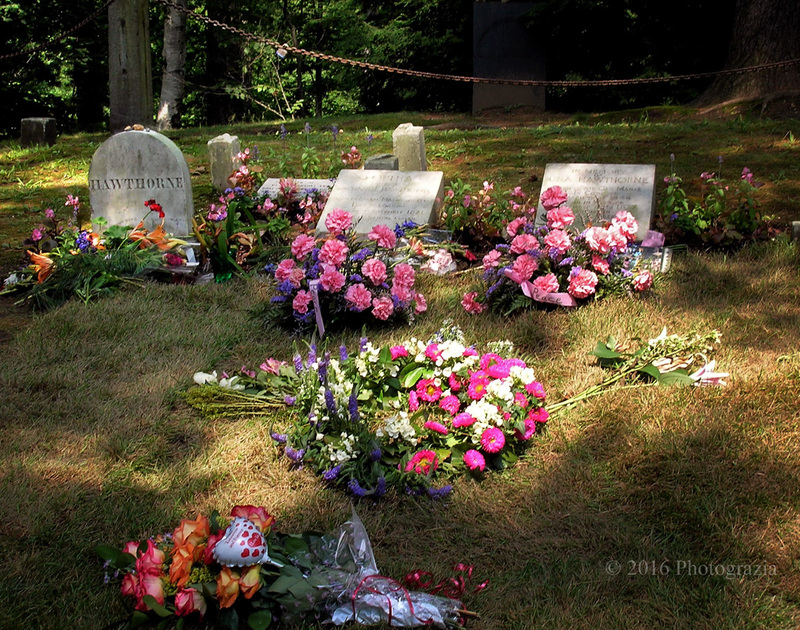 But on this particular day, I got to Nathaniel Hawthorne’s grave stone and I was amazed at the number of flowers at his site. I later learned why. I missed the re-interment by two days. Even though I didn’t get to see the majesty of the horse drawn carriage moving through the streets, I still felt like I was, in some way, a part of it. After all, the flowers were still fresh! If you ever find yourself in Boston, or New England for that matter, try and sneak away to Concord and Lexington, Massachusetts. You’ll feel like you are stepping back in time. This historical area boasts the birth of the American Revolution and the heart of American literature. Homes are open to the public, museums display precious artifacts and there is an energy there that will rejuvenate you! Safe travels, my friends! What a wonderful story – and the photographs! Brilliant, Debbi.